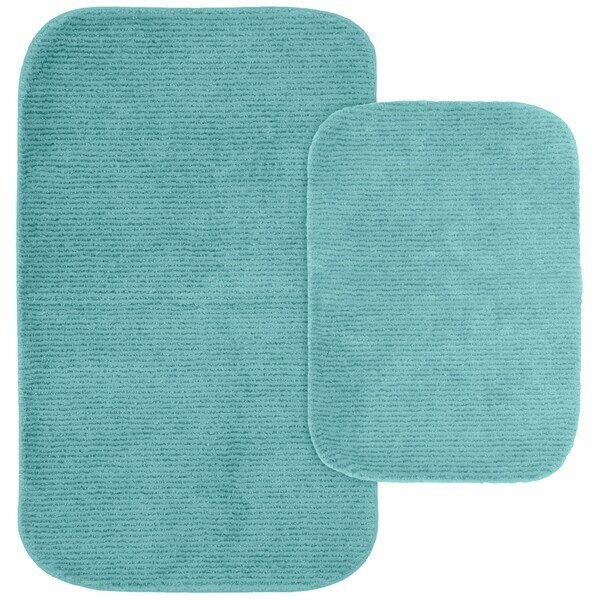 Glamour bath rugs by Garland Rug are soft and stylish. The pin stripe design lends a classic understated touch to your bath coordinates collection. This 2-piece rug set comes with both a 17 inch. x 24 inch. Bath mat and a 21 inch. x 34 inch. Bath mat. The soft pile of this rug is made of 100% Nylon and features a washable skid resistant latex backing. Please Note that size and color representation are subject to manufacturing variance and may not be exact. Also note that monitor settings may vary from computer to computer and may distort actual colors. Photos are as accurate as possible; however, colors may vary slightly in person due to flash photography and differences in monitor settings. Each rug/carpet is manufactured with the same colors as pictured; however they can be manufactured from slightly different "dye lots". Meaning when the yarn is dyed it can vary in shade ever so slightly.